Forklift trucks are available in many variations and load capacities. In a typical warehouse setting most forklifts have load capacities between one and five tons. Larger machines, up to 50 tons lift capacity, are used for lifting heavier loads, including loaded shipping containers. 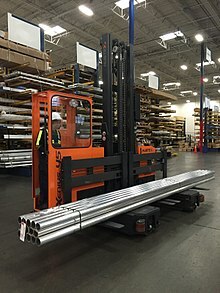 Rider order picking truck – commonly called an "Order Picker"; like a small Reach Truck, except the operator rides in a cage welded to the fork carriage, while wearing a specially designed safety harness to prevent falls. A special toothed grab holds the pallet to the forks. The operator transfers the load onto the pallet one article at a time by hand. This is an efficient way of picking less-than-pallet-load shipments, and is popular for use in large distribution centers. Articulated very narrow aisle counterbalanced trucks – sometimes called "Flexi or Bendi Trucks" after two of the largest manufacturers. Comes in stand on center control, and sit down center control, which is the most numerous. May have an internal combustion engine or an electric motor. Electric motors are most common. Engines may be diesel, kerosene, gasoline, natural gas, butane, or propane fueled, and may be either two-stroke spark ignition, four-stroke spark ignition (common), two-stroke compression ignition, and four-stroke compression ignition (common). North American engines come with advanced emission control systems. 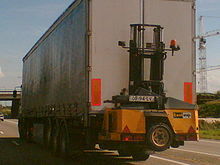 Forklifts built in countries such as Iran or Russia will typically have no emission control systems. Some units have hybrid drivetrains. 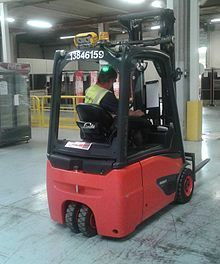 Unlike standard counterbalance and reach forklifts, These forklifts are steered via the front swivel articulation of the forklift and are therefore much different to manoeuvre than regular forklifts and additionally have no pantograph feature for retrieving stock in narrow aisles. Truck-mounted forklift / sod loader – comes in sit down center control. Usually has an internal combustion engine. Engines are almost always diesel, but sometimes operate on kerosene, and sometimes use propane injection as a power boost. Some old units are two-stroke compression ignition, most are four-stroke compression ignition (common). North American engines come with advanced emission control systems. Forklifts built in countries such as Iran or Russia will typically have no emission control systems. The slightly more stringent GS, DS, LPS, and GP/LPS, or Safety standard does provide some minimal protection, however it is extremely minimal. In the past Underwriter's Laboratory offered specialty EX and DX safety certifications. If you require higher levels of protection you must contact your local Underwriter's Laboratory Office and check ask them what the correct safety standard is for your workplace. Power source – may consist of an internal combustion engine that can be powered by LP gas, CNG, gasoline or diesel fuel. Electric forklifts are powered by either a battery or fuel cells that provides power to the electric motors. For warehouses and other indoor applications, electric forklifts have the advantage of not producing carbon monoxide. Attachments – may consist of a mechanism which is attached to the carriage, either permanently or temporarily, to help in proper engagement of the load. A variety of material handling attachments are available. Some attachments include sideshifters, slipsheet attachments, carton clamps, multipurpose clamps, rotators, fork positioners, carpet poles, pole handlers, container handlers and roll clamps. ^ a b Brindley, James (December 2005). 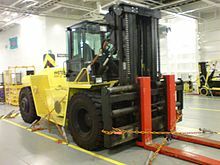 "The History of The Fork Lift". Warehouse & Logistic News. Archived from the original on 2009-08-31. Retrieved 2008-01-25. 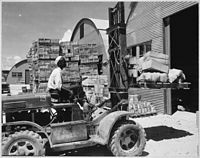 ^ "Forklift- The Backbone of The Industry". MHEDA Journal Online. Archived from the original on 18 December 2007. Retrieved 2008-01-25. 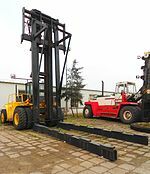 ^ "What is a Forklift Container Mast?". Eureka Forklifts. Archived from the original on 13 December 2013. Retrieved 16 September 2013. ^ "Forklift Operator Safety Training". MASCO.NET. Archived from the original on 26 August 2012. Retrieved 8 December 2012. 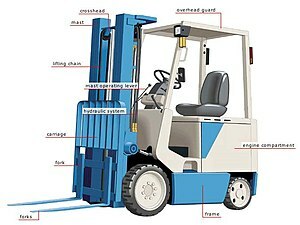 These lifts usually have solid rubber tires, and are common in factories and warehouses. 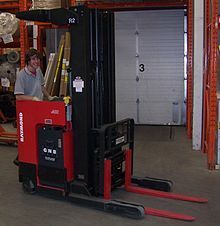 If equipped with pneumatic tires, this kind of lift can be used out of doors. ^ "Industrial Truck Association". Archived from the original on 13 January 2008. Retrieved 2008-01-22. ^ "OSHA Standards: Powered Industrial Trucks". Archived from the original on 22 December 2007. Retrieved 2008-01-23. Weiss, MS; Bowden, K; Branco, F; et al. (2011). "Opioids Guideline". In Kurt T., Hegmann. Occupational medicine practice guidelines: evaluation and management of common health problems and functional recovery in workers (online March 2014) (3rd ed.). Elk Grove Village, IL: American College of Occupational and Environmental Medicine. p. 11. ISBN 978-0615452272. Forklift LPG Cylinder Mounting, Proper cylinder mounting and LPG forklift cylinder safety. In Queensland, Australia, when applying for forklift licence, follow these steps.